Rung in memory of 25446 Private William Fowles, Royal Welsh Fusiliers, a resident of this Parish, killed on September 18th 1918 during The First World War and remembered on the Dorian Memorial, Greece. Last updated Saturday, 22 September 2018 at 13:28:21. First submitted Saturday, 22 September 2018 at 13:27:12 by Peter L Furniss. 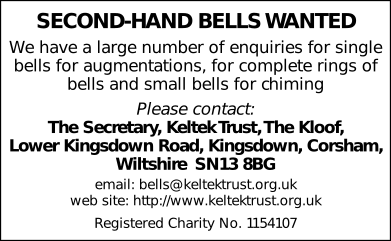 Sent for publication in The Ringing World on Saturday, 22 September 2018 at 13:29:43, and printed in issue 5606.